These fantastic looking glass towers in Wolfsburg, Germany, are storage silos for brand new Volkswagens. 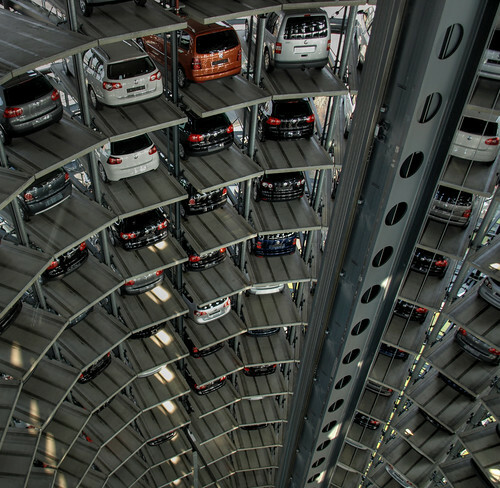 The 20-story, 50 metres high and 28 metres wide towers with a storage capacity of 400 vehicles each, are connected to the adjacent Volkswagen factory through a 700 metres long underground tunnel. The completed vehicle are transported to the tower through a conveyor system. Thereafter it is lifted by means of huge swivelling lift to the desired level and then again transferred by a small conveyor to the assigned cubicle. A customer purchasing a car has the option to collect it up from the tower where the customer can follow on screen as the automatic elevator picks up the selected car in one of the silos, brings it down and it is then transported out by conveyors to the customer without having been driven a single meter - the Odometer of every car so delivered is therefore always on Zero. The entire operation is fully automated and it takes about 30 seconds for a car to be picked up from its cubicle and delivered to the customer centre. Every time a car leaves the silo a new car enters the tower via the automatic underground conveyor system. The towers are part of Volkswagen's Autostadt (Auto city) opened in June 2000 which besides the factory, it's showroom and the silos also has a car theme park, a car museum and a hotel. How much does this cost to build? As per Wikipedia link given in the post "Volkswagen had invested approximately 850 Million Marks (€435 Million) in the project"